1. Wrap the garlic in aluminium foil, cook in an oven preheated to 170ºC, gas mark 3 for 45 minutes. Allow to cool down and peel the skin off. 2. Cut the avocado into medium-sized slices and place in a pan over medium heat. This will prevent the avocado from oxidizing. Dice into medium-sized pieces. 3. Place the water in a pan over medium heat and allow to come to a boil. Add the garlic, the Marmite, ground cumin and the oats. Turn the heat to low and allow to cook for 2 minutes. Add the beans and mix until a coarse paste is formed. 4. Fold in the diced beetroot and avocado. Divide the mix into 2 equal portions and flatten them until patties are formed. 5. Melt the butter in a pan and sauté the mushroom until soft. Brush the patties with a little oil and place on a hot grill and allow to form a crust on both sides (about 2-3 minutes). Slice the bread in half and place on the barbecue, cut side down. 6. Add a dollop of mayonnaise, mustard and ketchup to the bottom half of the burger bun. In the meantime, place the cheese on top of the patty and place on the barbecue, lid on, in order to melt. 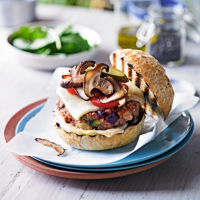 Place the patty on top of the sauces and finish with tomato, mushrooms and rocket and gherkins.